Our greatest moments in life come from extending ourselves and pushing outside of our comfort zone. Too often however, it is easier to just stay put rather then moving forward and trying something new. There is comfort in what is familiar. There is fear associated with the unknown. Fear can rule you – if you let it. Something that I have always been fearful of is public speaking. I think this fear developed through not doing any at all during high school. My first year at university, I had to give a 5 minute talk in front of a tutorial group of 25 peers – I was sweating, felt clammy, shaking and feeling violently ill. I was in fact shaking that bad that our tutor went out of his way to make sure I was alright. I’m not sure what I was scared of…. 2) It’s not you versus them. It’s what you can offer your audience. 3) The technique of ‘over extending’ when beginning a talk. By ‘over extending’ in this way you restore a balance between the feelings of under-confidence that you had and the over-confidence of your actions. Suddenly your audience isn’t as scary as you thought and feelings of nervousness start to disappear. By confronting my fear of public speaking I allowed myself to push outside of my comfort zone. Closely related to comfort zones are goals. It’s not surprising that Zombies, Run! motivated me to return to running during 2012, as this geo-location running game has specific goals to achieve as the story plays out. Once the story finished however I found that I had little motivation to run – I was goalless. So I decided to register for the 10K Foreshore run with the aim to do a sub 50 minute 10k – thanks to my colleague @carlieba for the inspiration. Now that I have a goal, once again I am extending myself in training and running with purpose. Ironically, from my own experiences, sometimes meticulously defining goals can be counter-productive. If you don’t have any guidelines you are free to take everything in, rather then pursuing something with laser focus. 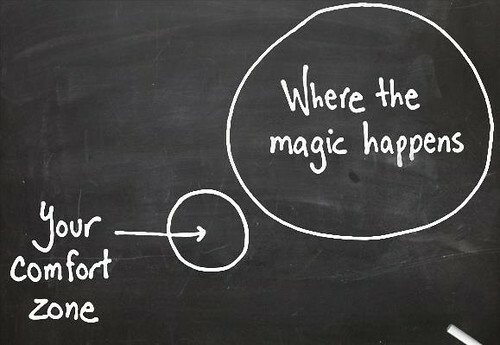 So on occasions, to push the boundaries of your comfort zone you need to remove any goals, plans or boundaries. Pushing outside our comfort zones can be liberating and is necessary for personal growth, but sometimes we can extend ourselves too far. Push too many boundaries and you have the potential to lose sight of the here and now. 2013 for me is a year of consolidation. I have the great fortune of working with some incredibly talented people and want to learn from them as much as possible.